MicroRNAs (miRNAs) are a group of small noncoding RNAs of about 19-25 nucleotides (nt) in length. miRNAs act as a binary switch and play a key role in RNAi-mediated gene silencing by inhibiting translation and/or triggering subsequent degradation of their target mRNAs. Recent advances in the field of molecular biology have highlighted the role of miRNAs in different biological functions, including embryogenesis, developmental pattern formation and differentiation, organogenesis, growth control and cell death like brain development, including patterning, neurogenesis, neuronal differentiation, subtype specification, and neuronal activity which is scripted via menus. DNA methylation and Histone modifications facilitating epigenetic manipulations in the genome were already a precursor for tumorigenic development. But recently miRNA mediated regulatory mechanisms also have been implicated in malignancy by regulation of DNA methyltion. Keeping these facts in mind, we have summarized the emerging roles of miRNAs in modulating gene function and affecting signaling pathways. 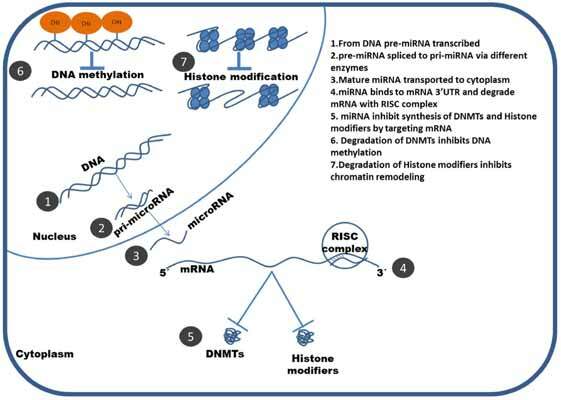 We have tried to focus into cancer cell physiology caused by miRNA mediated processes, and discuss the precise roles of miRNAs in modulating both DNA methylation and histone modifications. Cancer, DNA methylation, epigenetics, histone modification, miRNA. Department of Life Science, National Institute of Technology, Rourkela, Odisha-769008, India.